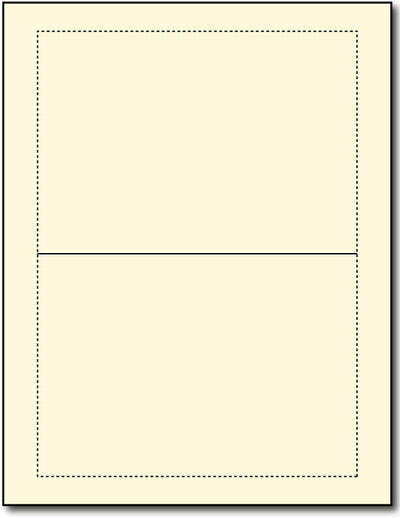 Linen Cream 5" x 7 Foldover Greeting Cards make it easy to print to the edge! Simply create a 5" x 7" card (7" x 10" unfolded) in your publishing program, center it to an 8 1/2" x 11" paper, and print. The actual card measures 4 7/8" x 6 7/8", leaving you 1/8" border for your card's bleed. 5" x 7" Print to the edge Greeting Cards are made from an 80lb Cover (216 gsm) linen cream cardstock. Inkjet & Laser compatible. This card is perforated for easy breaking and scored for easy folding! Created on an 8 1/2" x 11" sheet. Actual measurements are 9 3/4" x 6 7/8" unfolded, 4 7/8" x 6 7/8" folded.